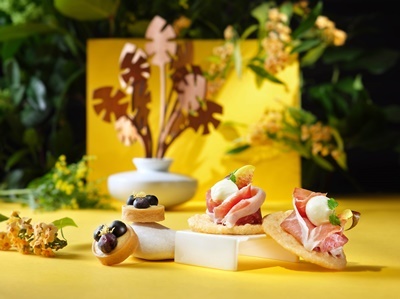 Inspired by Alessi’s first home fragrance collection- The Five Seasons, Tosca’s Chef de Cuisine Nicola Russo and Pastry Chef Alessandro Luppolo designed the afternoon tea set featuring sweet and savory delicacies using seasonal ingredients. Alessi’s The Five Seasons home fragrances capture the olfactory essence of the spring, summer, fall, winter and the transcendent season. World-famous design wunderkind Marcel Wanders created a slew of accessories for the collection including the candle holder and leaf fragrance diffusers. Awaken your senses through this rare collaboration between culinary artistry and olfactory magic. To evoke the emotions and the sensations connected with each season, the fragrances are aptly named “Brrr” for winter, “Ahhh” for spring, “Grrr” for autumn, “Hmm” for summer and “Shhh” for the transcendence. 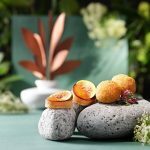 Sample the delectable “Brrr” bites Smoked Salmon Tartare and Orange Yuzu Custard Tart which translate the mature and essential winter scent of bergamot, orange and lily of the valley into gourmet dishes. Immerse in the mesmerizing autumn ambience with the “Grrr” bites Red Juniper Jam Mini Pavlova and Autumn Leaves which flaunt the perfume’s smoky overtones. The Five Seasons Afternoon Tea is a scrumptious feast not to be missed by gourmets and design connoisseurs.